Last week, it looked like the Airline Vikings had no chance of making the playoffs after losing to Byrd. But the Vikings (3-7) got a big boost in the Class 5A power rankings thanks to their 35-32 victory over Haughton and missed making it by a razor-thin margin. The top 32 teams made it. Airline was No. 33, just .02 of a point behind No. 32 Pineville (4-6), which lost its final five games. In Class 5A first-round games Friday, No. 13 seed Haughton hosts No. 20 Mandeville Fontainebleau (6-4) and No. 23 Parkway (5-4) travels to Monroe to face No. 10 Ouachita Parish (7-3). In a Class 4A first-round game, No. 16 Benton (7-3) hosts No. 17 Tioga (7-3) in a rematch of a game won by Benton 27-17 in Week 3 in Tioga. The Tigers, who finished second behind undefeated Northwood in 1-4A, will take a five-game winning streak into the game. In Class 1A, No. 22 Plain Dealing (3-7) visits No. 11 Montgomery (6-3). 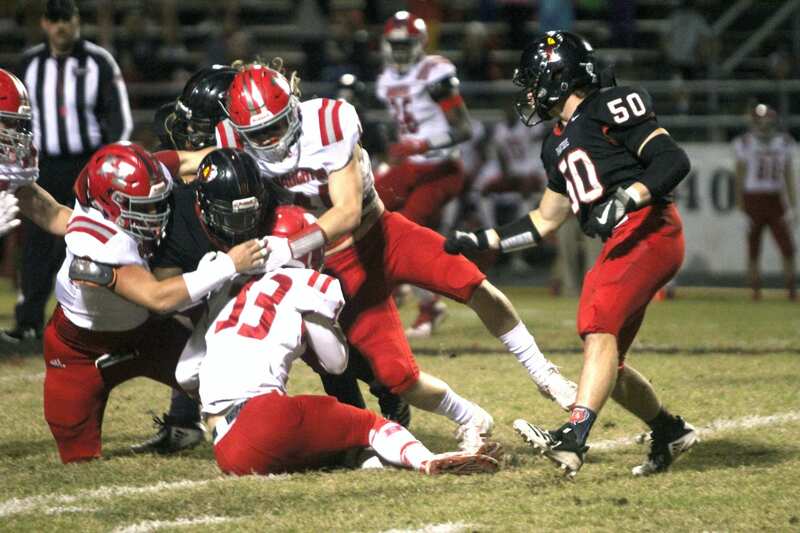 In last week’s other regular-season finales, Parkway rolled past Southwood 38-24 in District 1-5A, Benton knocked off Booker T. Washington 44-22 and Bossier fell to undefeated champion Northwood 56-28 in District 1-4A, and Plain Dealing lost to Homer 46-0 in District 1-1A. The Haughton-Parkway game was easily one of the season’s best although it didn’t start out like it was going to be. Airline led 21-0 after the first quarter and 28-6 midway through the second. But things quickly got interesting. The Bucs scored a late second-quarter TD to cut the lead to 28-13 at the half. Haughton scored three TDs in the second half and grabbed a 32-28 lead with 4:10 to play. But Airline converted a fourth-and-7 and regained the lead on Jamal Johnson’s 18-yard TD run with 2:30 left. Both teams got great performances from their quarterbacks. Airline senior Jordan Gladney passed for 363 yards, according to The Times, with most of that coming in the first half. He threw four touchdown passes in the half, two to Kevin Pouncy and two to Antavius Freeman. Haughton junior CJ McWilliams did not even expect to be playing quarterback Friday night. Sophomore Peyton Stovall, who missed the last two games with a sprained joint in his right (throwing) shoulder, returned as the starter against Airline and McWilliams returned to his usual wide receiver position. But Stovall re-injured his shoulder and only played three series before being replaced by McWilliams midway through the first quarter. All McWilliams did was account for 414 total yards, according to Haughton stats, and all five touchdowns. He completed 19 of 33 passes for 252 yards and three touchdowns with no interceptions. He also rushed for 162 yards on 25 carries and scored two TDs. For good measure, McWilliams also scored a two-point conversion. This is the first time Airline will miss the playoffs since Bo Meeks took over as head coach in 2011. I’m not sure calling the season a disappointment would be correct, though. Obviously, for a program used to winning seasons, it was disappointing to lose seven games. But six of Airline’s games were decided by 10 points or less and the Vikings lost five of them, so frustrating might be a better word to describe the season as I’ve mentioned before. Haughton had the best regular season of any parish team. The Bucs won eight games for the first time since 2014. They finished tied for second with Byrd in 1-5A. The three games pitting the parish 5A teams against each other were all close. Haughton defeated Parkway 26-23 and Parkway defeated Airline 23-21. But now it’s on to the playoffs. Here is a quick look at the parish teams’ first-round opponents. Haughton vs. Fontainebleau: The Bulldogs finished 5-2 in District 6-5A. Fontainebleau’s district losses were to Covington 35-21 and champion Slidell, the No. 12 playoff seed, 29-17. Their non-district losses were to Class 4A No. 5 Lakeshore 63-35 and 5A No. 18 Denham Springs 37-29. Covington did not make the playoffs. Fontainebleau is back in the playoffs after a one-year absence. Fontainebleau sophomore running back Iverson Celestine, who has already received several college offers, had 152 yards rushing on 28 carries and scored two touchdowns in a 29-19 victory over St. Paul’s in the regular-season finale. Parkway vs. Ouachita Parish: The Lions finished 3-2 in District 2-5A, falling to undefeated and No. 1 seed West Monroe 49-18 and No. 8 Ruston 23-20. Their non-district loss was to Class 4A No. 4 Neville 17-14. Ouachita Parish has a powerful running game led by Chaunzavia Lewis and Dylan Roberts, both of whom went over 100 yards in last week’s 42-20 victory over ASH. Ouachita Parish reached the second round last year. Benton vs. Tioga: In the first game against Tioga, the Tigers ran for 358 yards. Keldric Moody had his best game of the season, rushing for 205 yards and three touchdowns. The game also marked Clint Lasiter’s first start at quarterback. He passed for 172 yards. Bubba Osby caught five passes for 126 yards. Tioga went 3-1 in District 3-4A, losing to undefeated and No. 6 seed Leesville 33-23. The Indians’ other non-district loss was to 5A No. 32 Pineville 48-35. Tioga reached the second round last year. Indians sophomore quarterback Blake Mcgehee has passed for 2,402 yards and 26 TDs with just five interceptions. He threw for 336 yards against Benton. Antonio Logan leads the team in rushing with 791 yards on 106 carries. He has scored 12 touchdowns. The leading receiver is Kenneth Ravare, who has caught 35 passes for 839 yards and seven touchdowns. He had nine catches for 135 yards against Benton. Plain Dealing vs. Montgomery: The Tigers went 4-1 in District 3-1A, losing only to undefeated and No. 4 seed Logansport 31-12. Montgomery’s non-district losses were to Class 2A No. 19 Lakeside 60-42 and Class 2A No. 17 North Caddo 32-28. Montgomery reached the second round last year.